What is the true meaning of love? The kids in Odyssey will find out, even while the town is buzzing with competition. A scavenger hunt pits Matthew, Jay, and Barrett against each other in a musical extravaganza. Can Barrett take his eyes off the prize to focus on what's truly important? Meanwhile, Olivia struggles to show "brotherly love" when Matthew wants to take away her role as Wooton's camp assistant, and Eugene must decide how to be honest when Connie showers him with a string of gifts . . . that he can't stand! Integrity, trust, and forgiveness are all put to the test as the folks in Odyssey learn the lessons of 1 Corinthians 13. 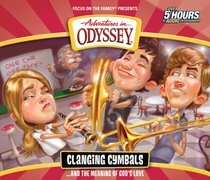 About "Clanging Cymbals... and the Meaning of Love (4 CDS) (#54 in Adventures In Odyssey Audio Series)"
Twelve all-new entertaining and character-building episodes based on 1 Corinthians 13. The album will teach kids what authentic agape love is and how to express that love to others. Featuring secret word/code access to new content on WhitsEnd.org and a fold-out Whit&'s End map. :Twelve all-new entertaining and character-building episodes based on 1 Corinthians 13. The album will teach kids what authentic agape love is and how to express that love to others. Featuring secret word/code access to new content on WhitsEnd.org and a fold-out Whit's End map.